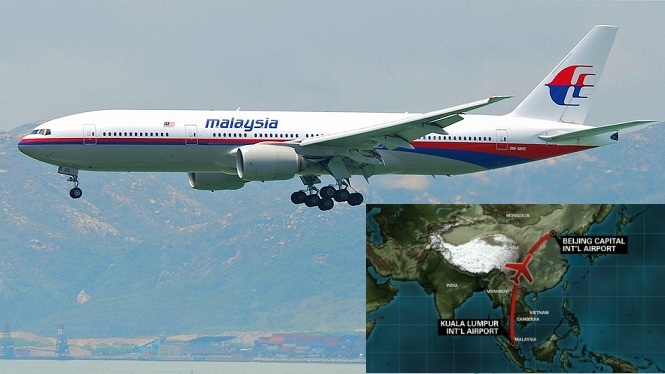 JNN 09 Mar 2014 Kualalumpur : Search area expanded due to possibility that jet has turned back, Malaysian minister says; Malaysia Airlines says they fear the worst. Aerial teams have resumed on Sunday morning the search for a Malaysia Airlines flight carrying 227 passengers and 12 crew members which went missing off the Vietnamese coast on Saturday as it flew from Kuala Lumpur to Beijing and was presumed to have crashed. BBC news reported that marine rescue teams worked through the night to search the waters off the coast of southern Vietnam, while the aerial teams resumed their task at the break of dawn Sunday. Malaysia’s Transport Minister Hishammuddin Hussein said Sunday that the search area for the jet has been expanded due to the possibility that the missing aircraft has turned back. He also confirmed that Vietnamese searchers found oil slicks at sea, but have yet to find any signs of debris. He said Malaysian investigators are checking the identity of four passengers on the flight, but have not yet determined if the plane was downed by an attack. There were no reports of bad weather and no sign why the Boeing 777-200ER, powered by Rolls-Royce Trent engines, would have vanished from radar screens about an hour after take-off. Malaysia Airlines said on Sunday it now feared the worst for its missing plane, more than a day after it went missing, and was working with a U.S. company that specialises in disaster recovery.A large number of planes and ships from several countries were scouring the area where the plane last made contact, about halfway between Malaysia and the southern tip of Vietnam. Vietnam on Saturday dispatched two navy boats from Phu Quoc island and sent two jets and one helicopter from Ho Chi Minh City to search for the missing airliner. It was readying a further seven planes and nine boats to join the search effort. China and the Philippines have also sent ships to the region to help. The United States, the Philippines, and Singapore also dispatched military planes to help in the search. A crash, if confirmed, would likely mark the U.S.-built airliner’s deadliest incident since entering service 19 years ago. The plane, aged over 11 years, disappeared without giving a distress signal – a chilling echo of an Air France flight that crashed into the South Atlantic on June 1, 2009, killing all 228 people on board. It vanished for hours and wreckage was found only two days later. Search and rescue vessels from the Malaysian maritime enforcement agency reached the area where the plane last made contact at about 4:30 P.M. local time (0830 GMT) but saw no sign of wreckage, a Malaysian Maritime Enforcement Agency told Reuters. Malaysia Airlines has one of the best safety records among full-service carriers in the Asia-Pacific region. It identified the pilot of MH370 as Captain Zaharie Ahmad Shah, a 53-year-old Malaysian who joined the carrier in 1981 and has 18,365 hours of flight experience. This entry was posted in Asia Pacific and tagged Malaysia, Malaysia Airlines. Bookmark the permalink.